Below, check out the new Netflix Binge Scale concocted by the streaming service to demonstrate which TV shows (and genres) people binge watch or devour and which ones they take their time watching, i.e. savor. Unsurprisingly, viewers tend to devour thriller and horror series like Bates Motel, Breaking Bad, Dexter, Sons of Anarchy, American Horror Story, Penny Dreadful, Scream, and The Walking Dead. Viewers tend to take their time and savor irreverent comedies like Arrested Development, BoJack Horseman, Unbreakable Kimmy Schmidt, and Wet Hot American Summer, and with political dramas such as Homeland, House of Cards, The Good Wife, and The West Wing. Here is the Netflix press release including the Binge Scale. 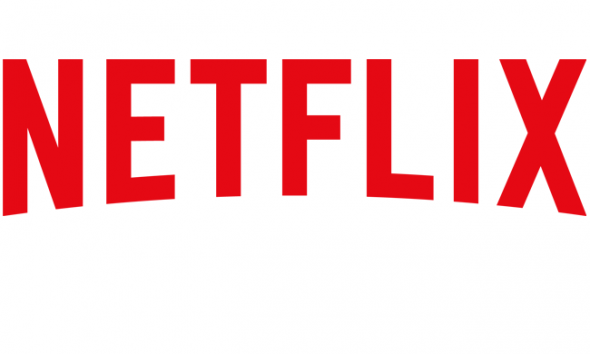 Netflix members around the world are making their own rules when it comes to watching TV. Instead of one episode per week, Netflix members choose to binge watch their way through a series – that is, on average, finishing an entire season in one week. Though binge watching is clearly the new normal, not all series are enjoyed the same way. 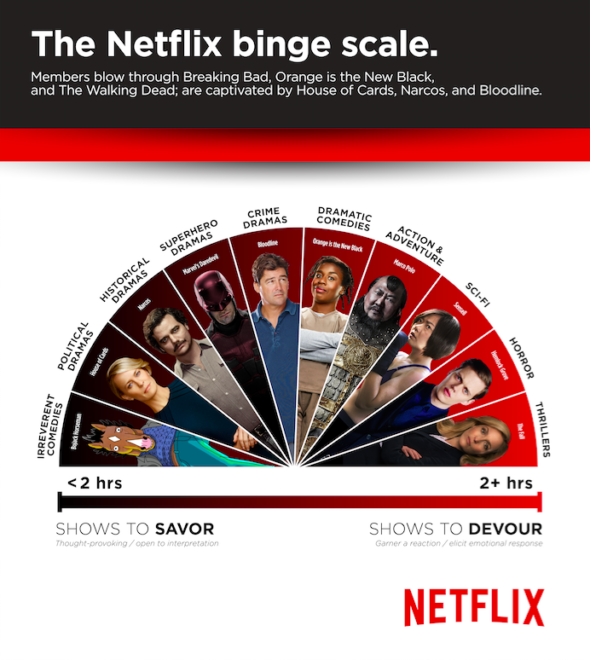 Today Netflix unveils The Binge Scale, revealing which shows we devour and which we savor. ** Not all series are available in all countries. What do you think? Which TV series do you tend to devour on Netflix? What kind of TV shows do you take your time watching? More about: 24, 24: canceled or renewed?, American Horror Story, American Horror Story: canceled or renewed?, Arrested Development, Arrested Development: canceled or renewed?, Arrow, Arrow: canceled or renewed?, Bates Motel, Bates Motel: canceled or renewed?, Better Call Saul, Better Call Saul: canceled or renewed?, Bloodline, Bloodline: canceled or renewed?, BoJack Horseman, BoJack Horseman: canceled or renewed?, Club de Cuervos, Club de Cuervos: canceled or renewed?, Dexter, Dexter: canceled or renewed?, F Is For Family, F Is For Family: canceled or renewed?, Fargo, Fargo: canceled or renewed?, Flaked, Flaked: canceled or renewed?, Gotham, Gotham: canceled or renewed?, Grace and Frankie, Grace and Frankie: canceled or renewed?, Hemlock Grove, Hemlock Grove: canceled or renewed?, Homeland, Homeland: canceled or renewed?, House of Cards, House of Cards: canceled or renewed?, La Reina del Sur, La Reina del Sur: canceled or renewed?, Mad Men, Mad Men: canceled or renewed?, Marco Polo, Marco Polo: canceled or renewed?, Marvel's Daredevil, Marvel's Daredevil: canceled or renewed?, Marvel's Jessica Jones, Marvel's Jessica Jones: canceled or renewed?, Narcos, Narcos: canceled or renewed?, Netflix TV shows: canceled or renewed?, Nurse Jackie, Nurse Jackie: canceled or renewed?, Occupied, Occupied: canceled or renewed?, Orange Is the New Black, Orange Is the New Black: canceled or renewed?, Outlander, Outlander: canceled or renewed?, Parenthood (2010), Parenthood (2010): canceled or renewed?, Peaky Blinders, Peaky Blinders: canceled or renewed?, Penny Dreadful, Penny Dreadful: canceled or renewed?, Prison Break, Prison Break: canceled or renewed?, Rescue Me, Rescue Me: canceled or renewed?, Scream, Scream: canceled or renewed?, Sons of Anarchy, Sons of Anarchy: canceled or renewed?, The Americans, The Americans: canceled or renewed?, The Blacklist, The Blacklist: canceled or renewed?, The Bridge (2013), The Bridge (2013): canceled or renewed?, The Fall, The Fall: canceled or renewed?, The Flash (2014), The Flash (2014): canceled or renewed?, The Following, The Following: canceled or renewed?, The Good Wife, The Good Wife: canceled or renewed?, The Killing, The Killing: canceled or renewed?, The Last Kingdom, The Last Kingdom: canceled or renewed?, The Walking Dead, The Walking Dead: canceled or renewed?, The West Wing, The West Wing: canceled or renewed?, Turn: Washington's Spies, Turn: Washington's Spies: canceled or renewed?, Twin Peaks, Twin Peaks: canceled or renewed?, Vikings, Vikings: canceled or renewed?, Weeds, Weeds: canceled or renewed?, Z Nation, Z Nation: canceled or renewed? Have you seen the first season of Condor, it is on AT&T. It was renewed for a second season, but the first season was fantastic. Need the ranch. We love it. iABSOLUTELY ATE UP rIVER..IT WAS WONDERFUL I WISH THERE WAS MORE..
We 70 somethings love netflix series that are well written and suspenseful, such as Bloodlines, House of Cards, etc. We justified Turn and loved it. In fact, binged our way through the series. Why do reviewers not consider our demographics when they rate series to determine whether to renew or not? We are the group that has time to watch good stuff and less income to spend on HBO, Starz, etc. Netflix is a bargain for the amount of entertainment is provides. We don’t watch sci-fi and horror! We’ve seen enough of that in our lifetimes.